Breaking Dawn Movie Trailer | Twilight Saga Official News: Three Breaking Dawn International Posters! Three Breaking Dawn International Posters! 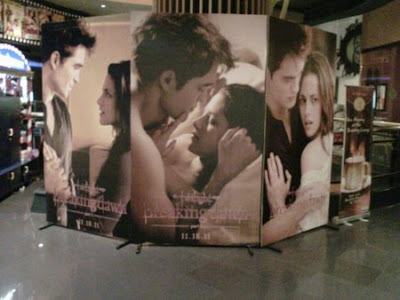 Although there's no official copy of this on the internet yet, someone from the Philippines took a photo of 3 Breaking Dawn Posters found outside of a theater on a certain mall and posted it on the web. This is so far the next big thing that we found related to the movie after the release of the first Breaking Dawn trailer that was unveiled on this year's MTV Movie Awards. Check out the posters below.